Harvest Gold Memories: Is the Future Pay TV Model As Safe as The Atlantic Believes It Is? Is the Future Pay TV Model As Safe as The Atlantic Believes It Is? Friday's (November 9, 2012) Marketplace by American Public Media had an interesting conversation with Derek Thompson, a senior editor at The Atlantic, about the future of television. In that interview, Marketplace's Tess Vigeland asks Mr. Thompson whether television is moving towards a more a la carte model where consumers can pay for only the shows they care to watch? I have speculated in several posts whether that's the direction TV is going (among them, HERE, HERE, and HERE). Much of it has to do with increasing fragmentation of the viewer market, hence the challenge of capturing advertising dollars for programming. There's another factor at work, too. Back on July 15, 2012, the Associated Press' reporter Ryan Nakashima wrote an article entitled "Behind the TV channel blackouts: stalling profits" in which he cited a spat that took place earlier this year between Viacom and DirecTV. However, that wasn't the only such incident, we've seen others between cable giants Time Warner Cable and Hearst Television and various others. At the heart of the AP article is the fact that content providers have become steadily more profitable while distributors (such as cable and satellite providers) that pay to carry the channels have seen their profitability virtually stagnate as they fight each other for subscribers, hence the bickering has become almost a routine experience. Most of us have seen the warnings, which now take the form of ads aired on local network affiliate stations about asking your cable/satellite provider to carry certain networks. During the first six and a half months of 2012, 22 fee disputes involving the price of broadcast TV signals have caused channel blackouts, according to the American TV Alliance. That's up from 15 blackouts in all of 2011. There were just four in 2010. "A small clutch of media companies owns 95% of the channels you watch. This oligopoly has the power to dictate terms to the cable/satellite companies that you pay each month. These cable/satellite providers are legally obligated to offer less popular channels alongside must-have networks like TBS and ESPN. That bundle costs the average household about $80, with roughly half going back to the media companies in 'affiliate fees' and roughly half staying with the cable companies in infrastructure costs and profit. Cable companies didn't invent the bundle. They're prisoners of the bundle, just like you and I are." While lawmakers are exploring the idea of mandating a la carte pricing, Mr. Thompson told Marketplace that the numbers just don't add up, which explains why the big media giants have the bundled prices they do. If you're Disney, they don't want to sell just ESPN, they also want to sell their less-watched networks like The Disney Channel, and their contracts force the distributors into such an arrangement. "You watch whenever you want, you don't have to pay for ABC Family or MTV2. That would be lovely. The problem is that when you do the back-of-the-envelope math, it becomes very clear very quickly that TV on demand would probably be either much more expensive than we think or much lower quality than we'd accept." said Mr. Thompson. Derek Thompson claims "The Internet, ironically, is less likely to disrupt video the same way that it's done for newspapers or music. We still have the same number of paid TV customers now that we did five years ago, during a recession. It doesn't seem like doomed times just yet for cable, but that doesn't mean it won't in 5 or 10 years," adds Thompson. He claims the cost of content continues to grow because it's labor-intensive. Yet his claim that traditional video (TV and movies) has held on to paid TV customers is suspect. There is some evidence to suggest that's not true. 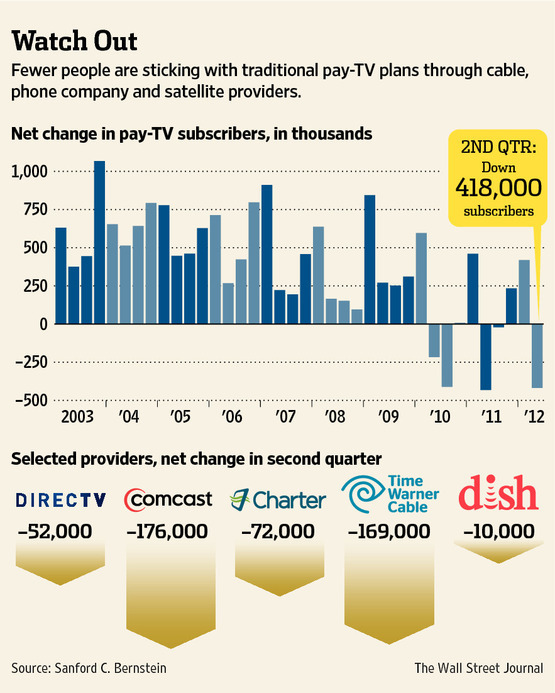 In August, the Wall Street Journal reported (see http://on.wsj.com/SHUo7y) that publicly traded cable, satellite and phone companies had a combined net loss of about 200,000 subscribers in the second quarter of 2012, earnings reports showed, about 0.2% of the roughly 100 million pay-TV subscribers. Also cited were some Sanford C. Bernstein estimates that the overall industry had shed more than 400,000 subscribers during the period when results for closely held operators are included. The one upside is that broadband has continued to grow even as pay TV subscriptions decline. But with fewer subscribers to pay the bills, the increases content providers are selling noted in the AP article are being disputed with growing frequency. 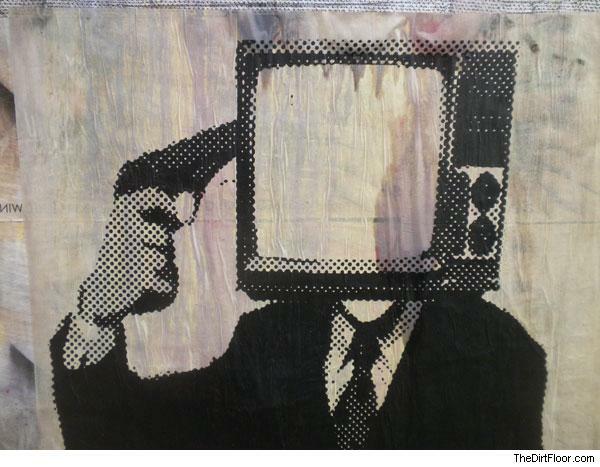 Tight economic times may have prompted some consumers to cut the cord (see HERE). As might be expected, the big media conglomerates like Disney and Viacom dispute those statistics. The following quote comes from the Wall Street Journal article (see above). "Dish Network Corp. Chairman Charlie Ergen, acknowledge that people are switching to cheaper alternatives. He even cites his own children's behavior as proof. Others, particularly on the entertainment side, dismiss the idea." However, the Wall Street Journal quotes Craig Moffett, an analyst at Sanford C. Bernstein who points that the year-on-year growth rate [for cable and satellite providers] is below the level at which new households are being formed, suggesting "there are homes that are cutting the cord." But they aren't cutting the cord completely, so far, it's basically just for pay TV. There is now growing evidence that consumers are switching to lower-cost alternatives, including broadcast (yes, it still exists, indeed, since the switch to digital, the number of options via broadcast has grown, see my post HERE for a few examples), as as well as internet sources including YouTube (I wrote about how there are now a few series developed for distribution via the internet by real Hollywood talent that are drawing loyal viewership), as well as subscription services like Hulu, Amazon Prime and Netflix, most of which can be viewed not only from personal devices, but also on the television with media players such as Roku and rivals made by Sony and others. However, Ericsson study also found that in terms of what consumers want most from their TVs, good quality programming remains the top factor. Is there a way to reconcile these demands? Basically, the business model is built around the presumption that advertisers pay for content. One way is to pay a higher price for channels viewers actually WANT. But that is likely to cost more. It's kind of like healthcare insurance. The only way to keep up with the rapidly-growing costs to care for sick people is to offset them by including enough healthy people who don't use the services into the equation. Tess Vigeland did make a comparison to health insurance in her interview, and Mr. Thompson did acknowledge the comparison was relevant. "Every single time you pay, let's say $80 a month to Time Warner Cable, ESPN gets $5 of that. So I sort of calculated that if you wanted to buy ESPN alone, you might have to pay $10 or even $20 just to get ESPN every single month to offset the lost advertising," Derek Thompson said in the Marketplace interview. The alternative hasn't yet been factored into Mr. Thompson's equation, but may soon need to be considered. Right now, some original programming is being distributed via the internet, including a new sitcom referenced in one of my previous posts known as "Husbands" which is distributed via YouTube, albeit in short pieces. But there's also a possibility they could modify that and make it available via one of (or all of) the online distribution channels including Hulu, Amazon Prime and Netflix. Mr. Thompson, in his article for The Atlantic, does acknowledge the looming threat of the internet, writing "Combined with a second trend -- the accelerating exodus of attention away from television -- the TV business might really be in trouble. But this second trend is still more of a projection than a reality." He argues it's not a factor at the moment, by writing "One hundred million households still pay for a bundle of networks. That number isn't really going down. With the pace of household formation tripling in the last year, it could even go up. The number of cord-cutters -- households that have replaced the bundle with over-the-Internet video like Netflix -- is in the low single-digit millions." However, he neglects the fact that a) most younger consumers are more likely to watch TV programming on their mobile devices, including smartphones and tablets, and b) those are the very same consumers who are now forming new households. Remember when they said that landline telephone carriers like SBC and Verizon had a stable, utility business? Well, that went the way of the telegraph ... gone. Today, many consumers have only their mobile phones as their only telephone number, and younger consumers are much more likely to fit into this category than their older counterparts. What makes him so certain they won't view cable TV the same way? Indeed, earlier this month, AT&T Inc. said it was laying the groundwork to phase out all of its old-fashioned telephone service (see the Wall Street Journal article at http://on.wsj.com/Ukv9rE for details). The company announced it wants to eventually decommission the technology behind its decades-old, copper-line phone network that currently covers 76 million homes and businesses in 22 states. It's a similar story at Verizon, whose FiOS broadband service is rapidly outpacing the revenue for it's old, legacy landline service (see http://on.wsj.com/RTEx7f for more). The projection that cable is somehow immune from this long-term trend remains a big unknown right now. As the Boston Globe reported (see http://b.globe.com/TQfR37), "Fifty percent of the people who watch online video are under the age of 35," according to Brad Adgate, senior vice president of research at Horizon Media. As viewership either migrates from television to online or diffuses between them, so do ad dollars. Genuine TV producer including Brian Robbins, a veteran producer of TV shows including "Smallville" and "One Tree Hill" are embracing internet content, starting their own YouTube channel dubbed "AwesomenessTV", which targets kids and teens with everything from dramas like "The Runaways" to talk shows. 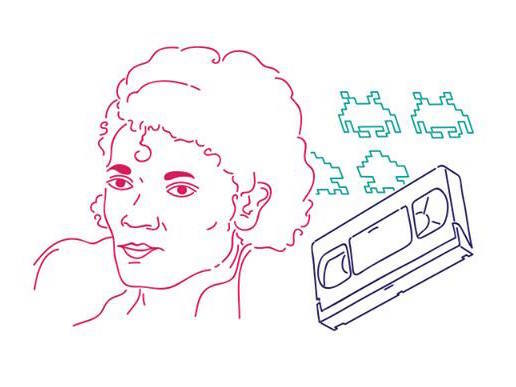 Another TV veteran, Jane Espenson, is also pushing fast in that direction with content aimed at adults, so the speed of change might not be so theoretical after all. It should be noted that Ms. Espenson's "Husbands" internet sitcom was self-financed, and raised funds for season 2 via fans who paid for the the second season through a successful Kickstarter campaign (see HERE) which raised the $60,000 needed to pay for the second season (see HERE for more), and have set their sights on season 3 already with a goal of $75,000. As the Boston Globe notes "Much of the online content boom can be attributed to the shrinking of costs to produce high-quality video content. A couple of cameras, some computer programs, a few actors, and you're good to go." To be sure, TV doesn't show signs of the growing online threat ... yet. 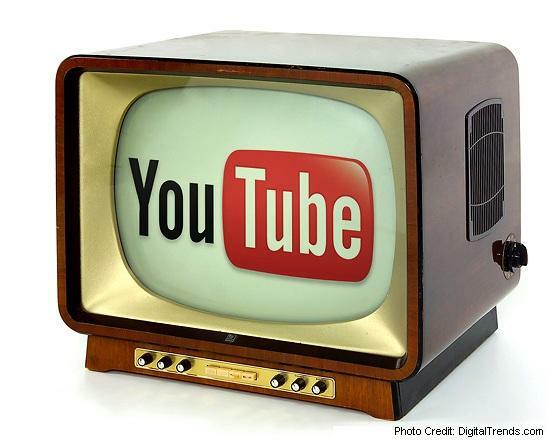 "Since it was founded in 2005, YouTube has been predominately the home of user-created video. But by putting out a welcome mat to Hollywood, the site is trying to lure viewers to stay for longer and coax advertisers to pair their brands with known talent. Robert Kyncl, YouTube's global head of content and the leader of its channels initiative, says the first year has been one of defining where YouTube's channels fit into the media landscape. 'I feel we're 300 percent smarter than we were in January,' he says." Shishir Mehrotra, director of product management at YouTube, said in a separate interview "Up until now, the primary noun on YouTube has been video. You watch a video, you share a video, a video has view counts and so on. We're gradually shifting the site so the primary noun on the site is the channel, and you tune into the channels that you care about." "TV has generally made more money by showing more and more advertising," added Mehrotra. "Our view is that we should actually show you fewer ads but make sure the ads are actually being seen." APM's Marketplace also covered YouTube programming (see http://bit.ly/UpaWXz). The primary motive for Google is advertising. But with momentum like what Jane Espensen is doing with original programming on YouTube, the argument that cable subscriptions are likely to hold up without interruption into the future seems suspect. My local NPR station WNYC also addressed producing TV content for the internet in May 2012. You may listen to that below, or by visiting http://bit.ly/2bDnBkQ.